This ice cream cake was a welcome challenge during the hot summer months! I decided to halve the entire recipe and made a mini cake (that was still large enough to serve 12 people). 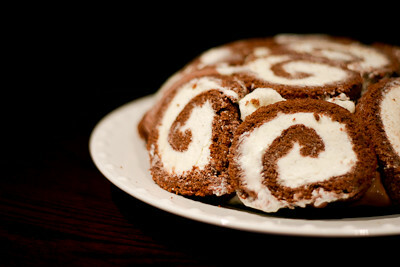 The first component was a swiss roll that is filled with a vanilla whipped cream. I was familiar with the rolling method, as I've made pumpkin rolls in the past. The only change I made here was to use a 13x9-inch pan instead. Even though I followed the recipe exactly, I felt like there was way too much whipped cream for the amount of cake present. 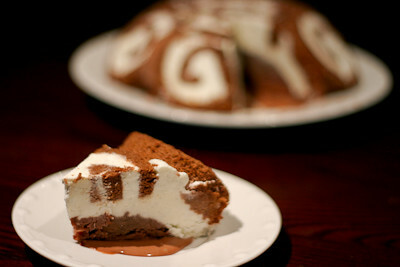 Plus, I think the cake would have been better if the roll had been filled with ice cream instead of just whipped cream. So, if I make this again, I'd probably fill it with chocolate ice cream instead. The ice cream layers and fudge sauce came together quite nicely. I was at my mom's place when I made this recipe, so I made the ice cream without an ice cream maker. If you don't have an ice cream maker, you can find instructions on how to make your own ice cream here. I think my favorite part of this cake was the chocolate ice cream. I loved how it was rich and creamy without being a custard ice cream recipe. I will definitely be making it again. As a whole, this recipe was fun to make, but I'm not sure if I'd make it again. I'll definitely make the chocolate ice cream again, but when it comes to ice cream cakes, I think I prefer a traditional ice cream cake. Thanks Sunita, for hosting this month's challenge. Make sure you check out the Daring Bakers' Blogroll to see how everyone else enjoyed this cool and creamy summer treat. You do not need an ice cream maker for this recipe. But if you will be using one, make sure you churn the ice cream according to the manufacturer’s instructions after mixing the ingredients. Whipping cream is a lighter version of double cream, with at least 35 per cent fat, and it whips beautifully without being quite so rich. Vanilla extract is made from vanilla beans that have been steeped in alcohol while vanilla essence is commercial manufactured by chemicals. Caster sugar is finely ground granulated sugar. It can also be found as “superfine sugar”, “fruit sugar” or “quick dissolving sugar”. If you can’t find it, you can make your own by whizzing some regular granulated sugar in the food processor or blender. Keep aside enough time for cooling and chilling the rolls and also for the layers to firm up before adding the next one. Moreover, the ice creams have also got to be made before assembling. I spread out the challenge over two days. I made the cakes and ice creams on the first day, and the fudge topping and assembly on the second day. While adding the final layer with the second ice-cream, make sure not to add it right to the brim. It may spill and will not look good. While inverting the final dessert onto the serving plate, if the cling film refuses to budge from the bowl, just wipe the outside of the bowl with a kitchen towel dampened with hot water. The bowl will release from the dessert very easily. Take the dessert out of the freezer at least 10 minutes before serving, of course depending on how hot it is in your neck of the woods. Dip the knife in hot water for easy slicing. I agree, this would be great filled with ice cream instead of just cream. It looks scrumptious. I love the picture of the cake behind the slice. Great job! I was afraid that the whipped cream would get rock hard, so we filled our cake with a mascarpone mousse instead and it worked out great.